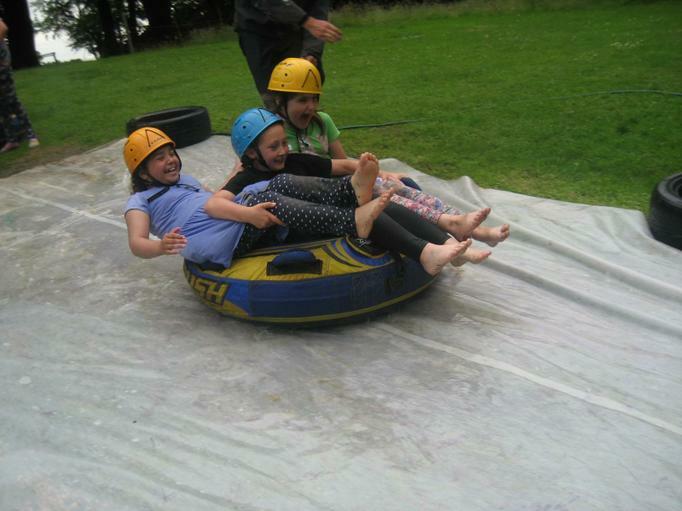 Years 5 and 6 went on a residential stay to Broomley Grange on Wednesday 6th and Thursday 7th July. 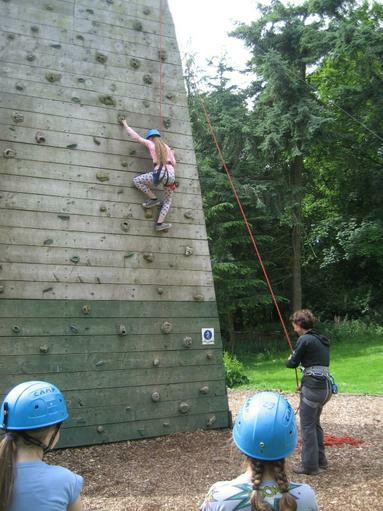 In the Northumberland countryside, we did lots of amazing activities such as zipwire, high ropes, archery, climbing and the water slide! At night, we camped in marquee-style tents in groups: that was unusual! 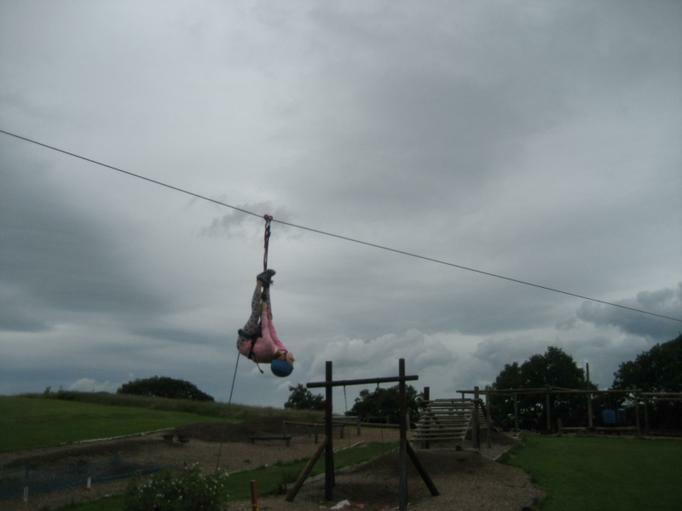 The best part of Broomley Grange was the zipwire because everyone enjoyed it. 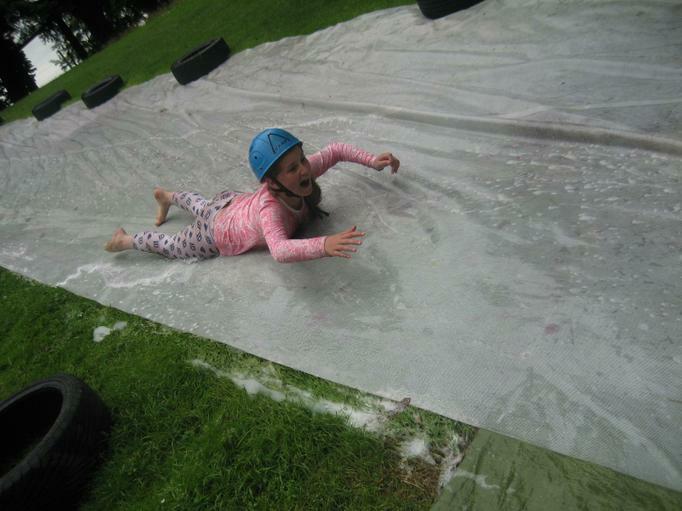 Before going to Broomley Grange, I felt happy and nervous; now I feel great and I want to go to Broomley Grange again. I learned how to make a campfire and our group made a roaring fire. I learned that the high ropes were scary, but I did it. I learned about trying new things and trying once is better than giving up. 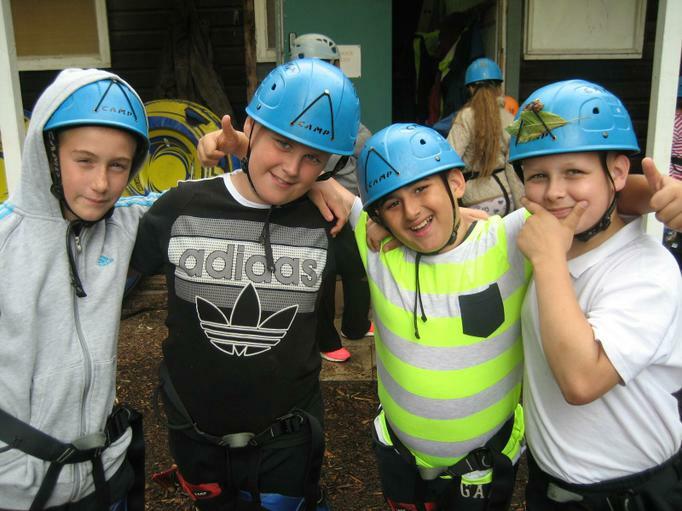 The best part of Broomley Grange was spending time with my friends and the zip wire. I felt scared because I have never slept out before.But I will sleep out again. I learned that they don't make you do things you don't want to do,they encourage you to do things like that. Before we got to Broomley Grange, I was feeling nervous incase we went on the zipwire first. It was lucky that we went on it the next day. Now I feel happier than ever because when I was on the high wires I dangled my life away. It made me feel like it wasn’t just a boring old trip out, it was a perfect trip to the perfect place. 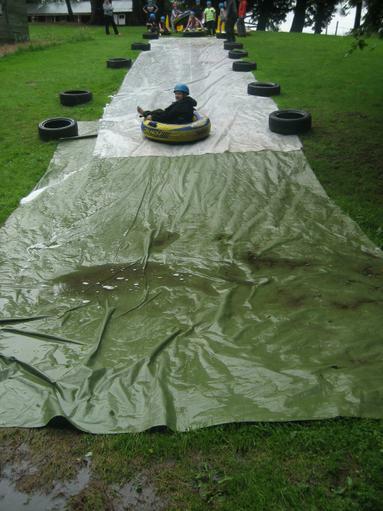 I think the best part was when we got to go on the obstacle course because there was a lot of different obstacles such as a rope climbing wall, tire jumps and we had to grab a rope and swing across the water without falling in. I felt really nervous and frightened, but when we were coming to an end, I felt really happy that I came and excited, so I had become more excited as the next two days went by. I learned that trying new things is better than not trying at all because I was scared to go on the climbing wall and tried it twice and made it in the end. Keep trying until you succeed. Residentials are offered to Y6 children because they want us to feel confident in trying new things, so when we go into high school, we are confident for new things. On residentials you try new things;you might learn you have a fear or that you are very talented in a particular activities. 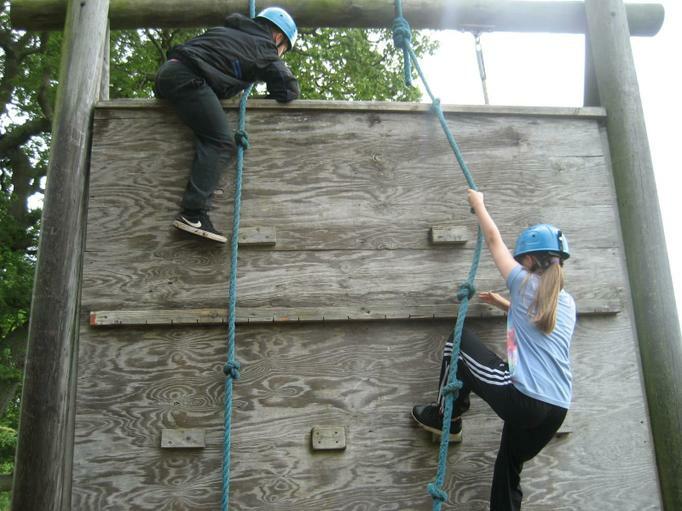 When I was at Broomley Grange, I learned that when I am scared and when I do it, afterwards I felt I could do it again and again. Classes 5 and 6 had an amazing time developing their dance skills with Fertile Ground, a professional dance company. Last week, years 5 and 6 worked their socks off with Fertile Ground dance company.We worked so hard that the word persevere doesn’t come close to it. During the week, we worked tirelessly. As I worked my socks off my feet, the rest of my group worked so hard that we nearly broke our bones dancing so hard.I was so tired, that if I stopped I’d never get back up. As I cartwheeled across the room, I heard the noise of a gargantuan audience applauding us.Dancing to the sound of the audience, was my heart beating like a big bass drum.We pranced across the ballroom like gas particles ricocheting off the walls. From the 13th of June, to the 17th, years 5 and 6 were practising a dance. In this dance, we followed the elephants through their daily lives. We were taught this dance by Fertile Ground, a professional dance company. We strutted our way through the week with the most stunning piece of art at Bede. This dance was telling people how elephants are in the savannah. The day came, Friday. We were all in sync and each dance had different speeds and dynamics. The energy spread around the the room faster than a lion. Everyone was focused on the dance and had a not good, not great, but spectacular performance. The day was coming to an end, but our energy hadn’t yet faded. The parents were sat there gob smacked and with jaws dropped. A magnificent week of dance! On the sixth of June, Year six went to London. We had to get school at 7:10am and got the minibus to Newcastle’s Central Station. At the station, we only had to wait 45 minutes until the train arrived, we all had comfortable seats and plenty place of and we didn’t have to sit beside any strangers. When we got to King’s Cross, it was packed with trains and crowds. As we walked towards the Tube we saw beautiful buildings towering above us ( and a McDonalds ). When we arrived at Trafalgar Square we ate our lunch as we baked in the scorching sun. Nelson’s Column was above us as we walked to the National Gallery. Paintings hung above as we whispered to each other.We strolled around ,looking at magnificent art ( some art was hundreds of years old!) When we finished walking around the galleries, we headed to Westminster Abbey. As we were walking, we headed straight through Westminster and saw the massive Big Ben! We saw the ground where there's parades and the soldiers with swords prancing around on there horses. We carried on our feet aching and the the police protecting downing street. They had guns loaded , full police uniform and they were talking to tourists. We saw traditional black cabs passing the Abbey. Men and women who worked they wore red and gave us a map on a wooden handle. We saw the tombs of aristocrats and royalty and some very important people as well. When we reached the area where we could see the weather, we saw there was a thunderstorm and it was pouring with rain. At that time we decided to have a snack and a drink while the storm passed. Then we decided to have a quick look in the gift shop not many people bought anything but a few did buy something. It had stopped raining and Mr Riley thought it was time for a class photo. We walked back to Leicester Square and continued to Buckingham Palace. As we walked down the long road to the palace we spotted fancy cars ( including Bentleys, Ferraris and a Rolls Royce ). We saw the palace and beside it a Royal Mail van. By this time we were hungry and we wanted to eat, so… we headed to Pizza hut in Leicester Square! Starving we headed in. When we headed in we saw an array of fizzy drinks: Pepsi Max vanilla and strawberry Pepsi. When we sat down we ordered our pizza and Mr Riley sent us to get a glass of pop. When everyone got a drink we headed for salad By the time we returned our pizza had arrived and we ate it in a flash. The ice cream factory was open so we all got ice cream, we ate so much ice cream we broke the machine! We we stuffed and we headed to the tube , but we didn't know it would be packed and some of the class got left behind with Reverend Jim. We waited for them at King’s Cross and headed off. When we got there, our train was packed and our seats were not booked. So some of us had to stand, but the ones who didn’t mostly had to sit with members of the public while Mr Riley kept an eye on us. The train was delayed by 90mins and the person who controls the microphone said we will not be stopping at Newcastle and that people going to Newcastle would have to stop at Doncaster and wait for the next train. So we waited for 50 mins until the next train arrived. Then we stood and sat until we got to Central Station at 00:55 am. Most of us headed back to school to meet our parents but a few of us headed back to our houses in our parent’s cars. The day after we got the day off because of the commotion but Neil came in. Unfortunately Jordan could not make it but we did still have a good time. Jordan showed up the next day fit and well. 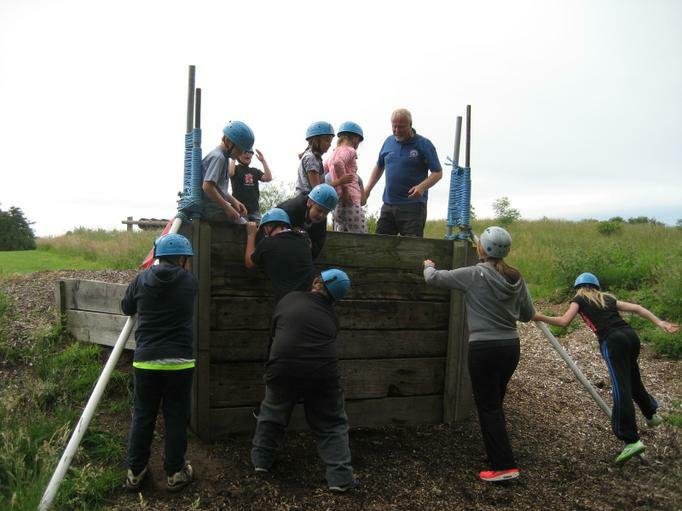 In July 2015, Classes 5 and 6 spent the day together at Broomley Grange, an outdoor activity centre in Northumberland. 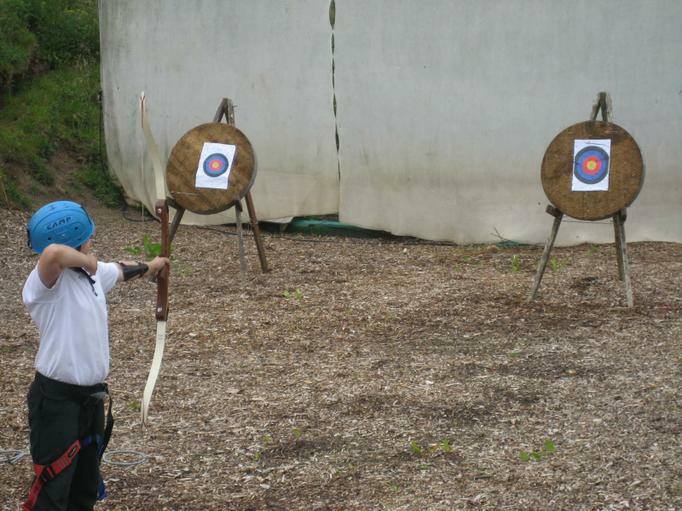 For many of us, it was the first time we'd done activities like these: assault courses, climbing, zip wires, archery and water slides! It was an absolute joy to watch the boys support each other on tough obstacles, the girls manage to crawl through dark, muddy tunnels first and most of all to see how when Bede children work together, they enjoy every minute of a challenge! 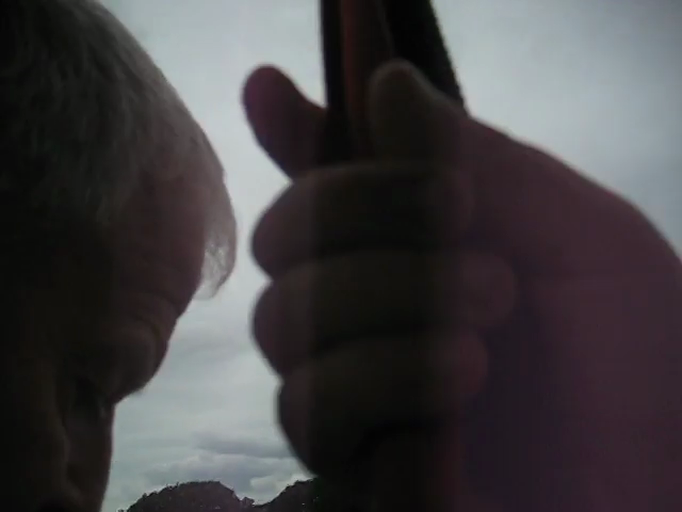 Check out the gallery below... and helmet cam, from the zip wire! How it felt to zip along a 60m wire, hanging from a harness!